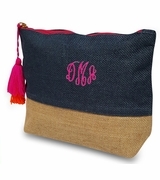 Personalized herringbone cosmetic bag. 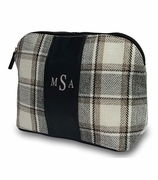 No stylish lady will ever leave on an overnight trip without a suitable cosmetic bag and this is a perfect choice. Reminiscent of age-old weaving techniques this classic herringbone pattern in gray and black pattern will always be in fashion. Nicely trimmed with a British tan center panel that can be embroidered with your monogram for a stunning and eye-catching finish. 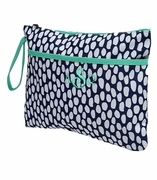 This sophisticated little bag will become your travel, gym or day to day accessory companion piece for cosmetics, tech cords or small day necessities. 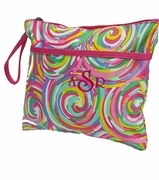 The embroidered herringbone cosmetic bag measures 12"W x 8"H.